Hello readers, it looks like I am running behind on my monthly update for the blog. It has been a busy month for me so I have not been very active in the community and for that I do apologize. 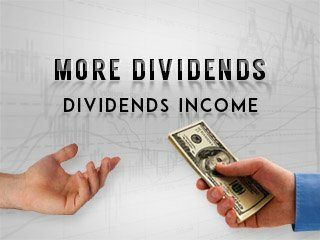 Things have been going on at More Dividends despite my lack of posting. As we all know April is not our strongest month but we did still receive some dividend income as well as making a small addition to the portfolio. 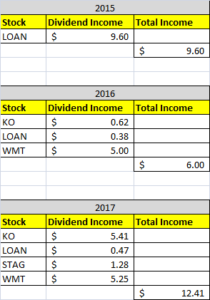 Also the portfolio received some dividend increases during this month which validates the whole ideology of being a dividend growth investor. So without further adieu, let’s go ahead and jump right into it. During April, I did make a small addition to my portfolio. I will continue to add to this position as I see fit since I think that it is a great company that is currently selling at a great price. While this is only a small addition it will continue to pay me dividends for years to come. Look for this position to continue to grow in the future. April was the first month of Q2 and accounted for $12.41 of my 2017 Dividend Income. Despite the small amount of dividend income that I received during the month, it was still a record for me for the month of April. I am hoping to continue growing my income that I receive during these slower months. 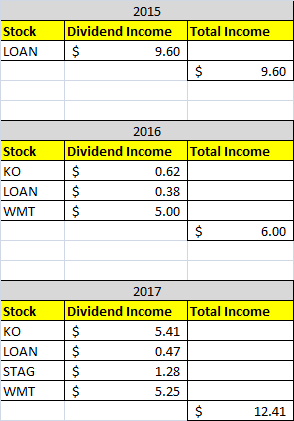 With the only changes in my portfolio being the small addition of Hormel Foods and the reinvested dividends, it hasn’t really changed my portfolio allocation that much. One thing that I did notice, while looking at how my portfolio was allocated during previous months, is that I seem to have a lot more balanced portfolio. Even with the big gains that I am showing in the financial sector, it still keeps a pretty even balance. Other than the small addition of Hormel Foods, not much else has changed in my portfolio. The small fluctuations of the market show but nothing major has changed since last month. Here are the articles that I posted on here during April. April was a good month for me considering my YoY growth. I look to continue building the income stream for these offbeat months. 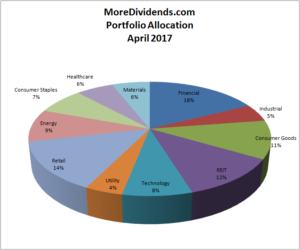 I have updated my Dividend Income and Portfolio to reflect the current standings of my portfolio. I have some good ideas for articles that I am currently working on, that I can’t wait to share with all of you. I look forward to seeing what new opportunities presents themselves in the markets. I will continue to put more capital to work as I am able to. Very nice – Hormel Foods is one of those stocks I wish I owned. You’ve got to love hitting a new record for the month. I hit a nice increase on a year-over-year basis as well. The only bad deal about April is the relatively small number of companies that actually pay out in the first month of the quarter. Positive vibes here. You’re doing well!